The initial reason I decided to take part was to raise awareness for Pregnancy and Infant Loss Awareness Month. I figured by posting every day, it would bring a deeper awareness and understanding to babyloss. I wanted to put a voice and face to bereaved parents. I wanted to help others who want to know what to say/not say and do/not do when they know someone who loses a baby. When the project first started, I wished it would last all year because I was enjoying it so much! But after a couple weeks, it was somewhat difficult to find the time to post something each day. I am glad I stuck with it until the end. It turned out to be very healing and beautiful for me. I didn't realize that sharing myself, as well as reading what others wrote/looking at their photos would be so special. It was just so powerful to see all the photos being posted on the event page from people around the world who are missing their little ones just like me. I felt such a deep connection to these moms (and dads) that I only know through their words and on the internet. I know them because of their precious babies and they know me because of mine. I am honored that they would share their little ones with me and many others. I wish I had much more time to look through all the photos! I spent quite a while looking through as many photos as I had the time for and really enjoyed it. 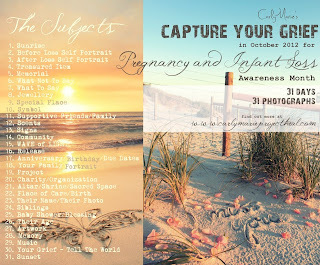 I am proud of everyone that took part in this and it's amazing to think that each person has friends and family seeing what they shared...that means that pregnancy and infant loss has reached a lot of people this month because of this project! What I loved most about the project was that I got to share Lily with people I know already, people I've met because of Lily, and people I continue to meet because of her. I don't always get to share my daughter because the simple truth is...loss and grief can make people rather uncomfortable. It was wonderful to share Lily so freely through this project. I got to share little memories from my pregnancy and special things that remind me of Lily in a very beautiful way. I love writing and photography (and sharing Lily!) :) so this project was perfect for me. I guess in a way it feels like people got to know her a bit more than they did before. If Lily were here, I would be spending much of my days with her...caring for her, playing with her, doing special things for her...this project was sweet because I got to spend the time I would be with her thinking about her...thinking about what I wanted to share for that days subject, what I wanted to photograph or what picture I already had that I could use, and smiling over the cherished memories. It was a process that I rather enjoyed because it felt like another way to mother her. -To visit the event page and to see the lovely photos others are sharing, click here. Hannah Rose, what a beautiful entry. I am sad also to see the project come to a close. I learned so much about myself in participating in it. I wish you the best.